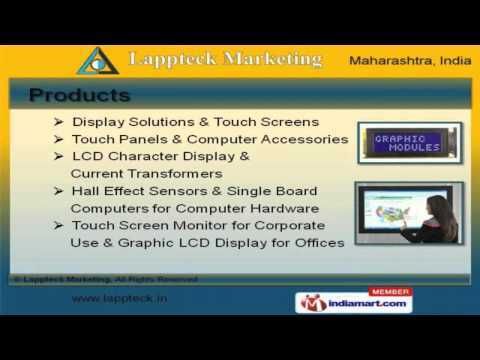 Welcome to Lappteck Marketing, Supplier and Trader of Display and Touch Screen Solutions. The company was founded in 2007 at Pune. We serve to Shopping Complexes, Institutions, Banks and other areas. Stringent quality checks, efficient transportation facility and Industry leading prices are some of the key factors behind our success. We offer a huge gamut of Display Solutions, LCD Character Display and Current Transformers. Display Solutions and Touch Screens offered by us are widely appreciated in the market. Our Touch Panels and Computer Accessories are in huge demand across the global markets. We also provide LCD Character Display and Current Transformers at cost effective prices. We have gained tremendous expertise in providing Hall Effect Sensors and Single Board Computers for Computer Hardware. Touch Screen Monitor for Corporate Use and Graphic LCD Display for Offices are a class apart.